Eagle Bucks is an excellent slot game from Ainsworth software developers. From the design and the theme, you can easily tell that it is an upgrade of a land-based slot machine game. This nature-themed slot game is simple, yet it offers chances of winning huge prizes. You will get a chance to travel to North America where you will interact with different wild animals like eagles, wolves, deer, and buffalo. The addition of 20 pay lines to the classic version ensures that Eagle Bucks video slot accommodates players with low bankrolls while the varied coin bets attract high rollers who hope to scoop the highest prize. With a theoretical return to player of 94.09% and a medium variance, your chances to win are higher compared to other Ainsworth Gaming slots. Eagle Bucks slot is built with the mobile gamers and slots enthusiasts in mind, as such, it is fully compatible with devices powered by Android and iOS systems. Read our comprehensive review of Eagle Bucks slot to discover how different symbols reward and where you can play for fun or real money. Animals have been widely used in Ainsworth Gaming video slots, and Eagle Bucks joins other titles, featuring all wild animals you expect to find when you visit North America. After the game has loaded, you will see familiar animals like a deer, the eagle, wolves and a buffalo on the reels. Other symbols in the game include arch-shaped rocks, a shield, and eggs with a tree-style backdrop. The artwork has been executed perfectly well compared to other upgraded land-based slot machine. The music and sound effects are excellent, and they will only be heard during the payouts and when the Eagle showcases in a winning combination. 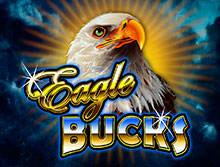 Eagle Bucks video slot allows players to spin reels for as low as $0.01 per line to a maximum of $100 per every spin. This brings the highest bet to $2000 for every spin. There also five reels and four rows which benefit from the 20 pay lines. Before you spin the reels, you need to adjust your bet. Click on the Gear icon to access the setting for Bet and Lines in play. In the bottom right corner of the screen, you will find the Spin and Autoplay buttons. Use the autoplay button when you want to play a specific number of spins without interference. The symbols in this slot are meant to help you in forming winning combinations. Ainsworth has listed them as a high tier and low tier symbols. As you would expect, the traditional card symbols K, A, Q, J, 10 and 9 represents the low paying symbols while the wild animals such as the eagle, a wolf, eggs in a nest represent the high paying icons. The huge Eagle is the wild symbol in this amazing slot. It substitutes for all other symbols except for the scatter symbol. This symbols will also reward handsomely when it appears in the pay lines. The Eagle Block logo is the scatter symbol in the game. The scatter can appear on the reels to unlock a decent payout of up to $200,000 coins from a single spin. Landing three or more of the scatters can also activate a bonus round. Three or more scattered Shield symbols will randomly trigger either 10 free games or free games with reel 5 held with Eagle. The Eagle will appear on reels 2, 3, and only during the 10 free games rounds. Eagle Bucks video slot from Ainsworth Gaming is designed to be played on small screen devices like smartphones and tablets. The latest technology like HTML5 enables this amazing slot game to retain high-end graphics, animations and flawless gameplay to Android and iOS powered devices. Also, Eagle Bucks slot is available in instant play mode only, meaning, there is no downloadable software or apps to put your device in danger. Ainsworth is a name that has been in the gambling world for two decades, and its popularity is still spreading far. The company has two licenses from the UK Gambling Commission and Alderney. This gives them a wider market compared to its competitors. Since they joined the online market in 2013, they have been on the frontline of delivering games with the state of the art graphics and visual animations. Most of their slot games such as Eagle Bucks have been upgraded from the land-based version, but they are still intriguing. Welcome to bCasino. As the name suggests, we are a pure British online casino site offering players from around the world a chance to win huge prizes. Our site was launched in 2018, but this does not make us any lesser than our rivals. We have a large game library of more than 500 titles from giant developers in the industry like NetEnt, Playtech, Evolution Gaming, Yggdrasil, etc. We teste all our games and the random number generator software to ensure that the results are random and fair always. Both new and regular players are entitled to different incredible bonuses and promotional offers to boost their bankrolls. With our unmatched customer support service, you are assured of full attention 24/7 via email and live chat.